When I woke this morning, the first thing that I did was to open my PC and surf the web to check the live broadcast of TopRank.com for the official weigh-in of the much awaited fight – Pacquiao vs. Clottey “The Event”. I saw how the Filipino community support our very own Manny “Pacman” Pacquiao and how confident our Champ is for the fight. What I like about this boxing event is that the two fighters seems so excited about the fight and doesn’t make any kind of violent scene and trash talks just to entertain the boxing world. Both fighters are humble and got sense of respect for each other. Pacquiao is really funny when he tries to throw his shoes to the roaring crowd during the weigh-in and confident that he will be victorious when he invites the people for a party / concert after the fight. 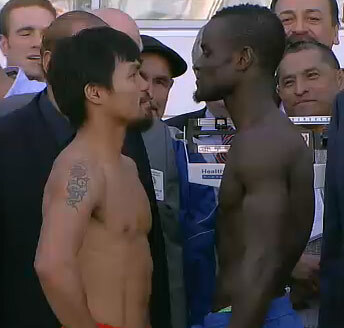 The official weigh-in revealed that Clottey is much bigger with 147 pounds compared to the 145 pounds by the Pacman. Despite that I still feel sorry (I don’t if this should be the right term for this, but I use this anyway) for Clottey. He is really the underdog for this fight and he is not really popular. No one is cheering him and shouting his name during his introduction to the venue. The guy should make a show on the fight to build his own fans. If he defeats Pacquiao, he will be instant popular and “millionaire.” If not then he will be another victim of the fast and furious Pacman. If you want to watch Pacquiao vs. Clottey, return here for a couple of hours and will guide you to the place where you could enjoy the match live. So be here when the time comes. John Louie O. Pamintuan on Bad Experience with Lazada Philippines : A Stressful Online Shopping Inconvenience! Jan Karlo Bajuyo on Bad Experience with Lazada Philippines : A Stressful Online Shopping Inconvenience! Where to Watch Pacquiao vs. Broner Fight Online? Where to Watch Pacquiao vs Matthysse Boxing Match? Using 1.1.1.1 Now – Much Faster Public DNS and More Private! Where to Watch Pacquiao vs Horn Fight Online or Offline?